The power of positive thinking! 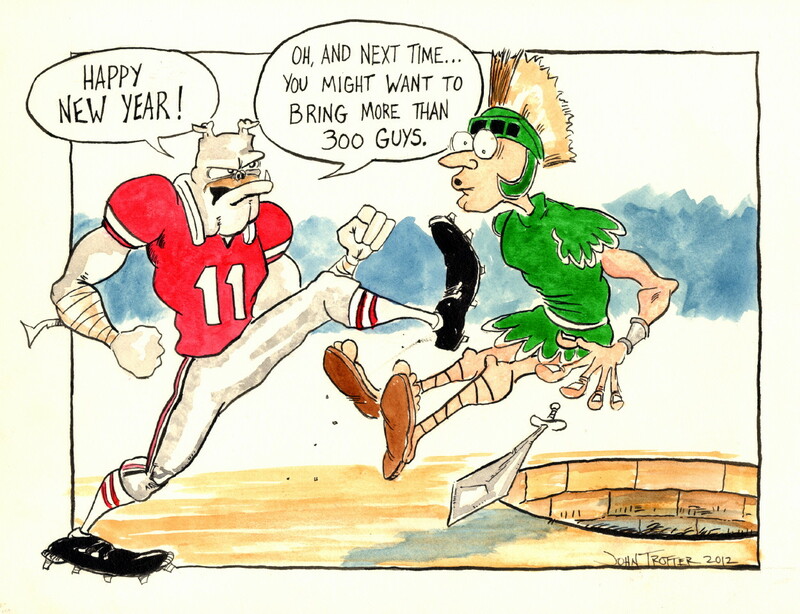 I have a Bulldog cartoon ready to go and I finished it up just in time to have a post for the first day of the year. Also, it felt very natural to sign it with "2012". Yep...good year a'comin'. So without further adieu...here is my first Bulldog of 2012. I DO feel a little strange using a semi recent movie reference as a punchline. I usually try to keep the humor a little broader and therefore more universal. 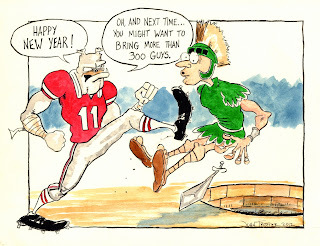 But it's been a LONG holiday season for numerous reasons, so Harry is gonna kick the Michigan State Spartan in a hole like Gerard Butler in 300. Done. Hope everybody had a great new year's celebration! I look forward to sharing more art with you and hopefully a fun surprise or two. The resolution to post every week continues! Have a great 2012 everybody!